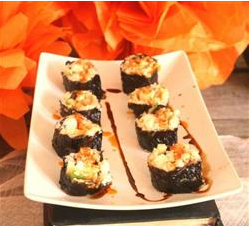 Its a very easy recipe to make sushi roll. The time consuming part in this recipe is to prepare rice which has to be soaked for 4 hour. The ingredients required with the instructions are given as follows. Firstly soak rice for 4 hours. Drain water and now cook the rice in a rice cooker with 2 cups of water. Rice must be kept slightly dry as vinegar will be added later. Mix in 6 tablespoons rice vinegar immediately to the hot rice after its cooked. Now spread rice on a plate until its completely cooled. Place 1 sheet of seaweed on bamboo mat, now press a thin layer of cool rice on the seaweed. Leave at least 1/2 inch top and bottom edge of the seaweed uncovered for easier sealing. Dot some wasabi on the rice. Arrange cucumber, avocado and smoked salmon to the rice by positioning them about 1 inch away from the bottom edge of the seaweed. Now slightly wet the top edge of the seaweed. Roll from bottom to the top edge with the help of the bamboo mat tightly. 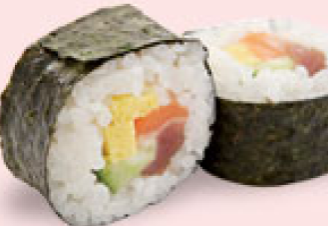 Cut roll into 8 equal pieces and serve. Repeat the same process for other rolls. Before adding the vinegar, heat the vinegar with two teaspoons of brown sugar until the sugar is melted which will take around 2-3 minutes. Let it cool a little for 3 minutes or so, then add it to the rice, it will enhances the flavor as the result.